WASHINGTON (WABC) -- Republican presidential front-runner Donald Trump is a grandfather - again. The billionaire businessman's daughter, Ivanka Trump, has given birth to her third child with husband Jared Kushner. 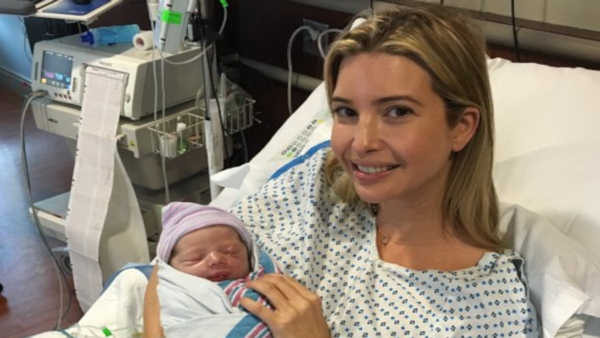 Ivanka Trump announced the birth of her son, Theodore James, on Twitter Sunday, saying that the family feels "incredibly blessed." Donald Trump, who has frequently made mention of his daughter's pregnancy while campaigning for the Republican nomination, has not yet made any public statements on the birth of his eighth grandchild. Ivanka is the second of three children Donald Trump had with ex-wife Ivana Trump.